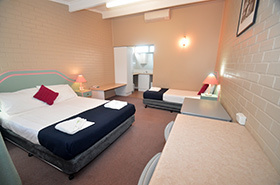 Parkview Motor Inn has 39 ground floor units with a fully licensed restaurant and bar opened Monday to Saturday and room service can be ordered to your room. We have a saltwater swimming pool. 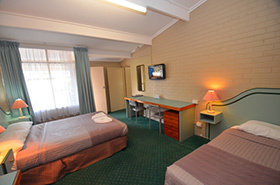 All rooms have Free WIFI and Foxtel with Premiere movie and sports channels. There is ample parking on site for trucks, trailers, coaches and mini vans. This Unit has 1 Queen and 1 Single bed. 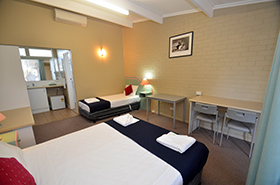 The Unit has free WiFi, tea and coffee making facilities, mini Fridge, toaster, iron, ironing board, reverse cycle air-conditioning, electric blankets, TV with foxtel and a hairdryer. 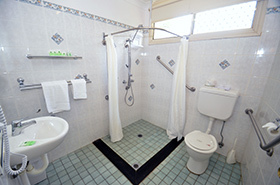 A roller away bed can be added for additional person. Rate is for 3 people. Cancellation policy: Cancellation requires 24hrs notice. Sleeps up to 6 people in one room. 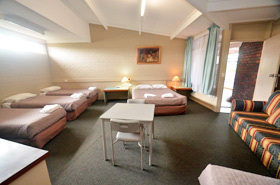 This room consists of 1 Queen and 4 Single Beds. 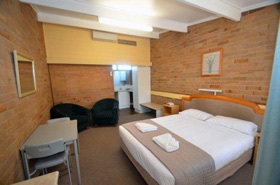 The Unit has free WiFi, tea coffee making facilities, microwave, fridge, toaster, iron, ironing board, electric blankets, TV with foxtel, hairdryer and new tiled bathroom. Rate is for 6 people. 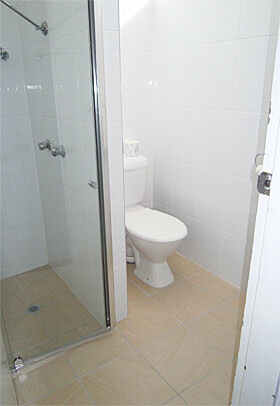 This unit can accommodate 6 people, 1 Queen and 1 Single bed in each room with an interconnecting door in between, suitable for the larger family. 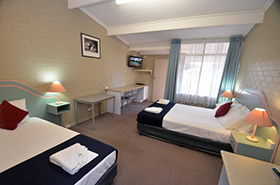 The Unit has 2 bathrooms, free WiFi, tea and coffee making facilities, toaster, iron, ironing board, fridge, electric blankets, TV with foxtel and hairdryer. Rate is for 6 people. 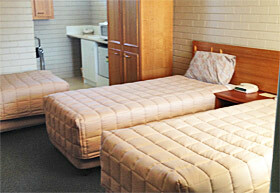 A Standard Room has 1 Queen Bed and can accommodate 2 people. 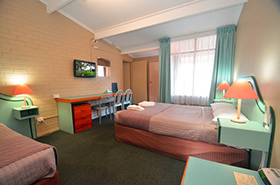 The Unit has free WiFi, tea and coffee making facilities, toaster, mini fridge, iron, ironing board, electric blankets, TV with foxtel and a hairdryer. A rollaway bed can be added. Rate is for 2 people. 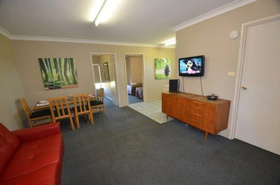 This Unit has 1 Queen Bed and 2 singles which is a standard family room which can accommodate 4 people. 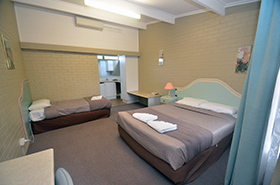 The Unit has free WiFi, tea and coffee making facilities, microwave, fridge, toaster, iron, ironing board, electric blankets, TV with foxtel, hairdryer and new tiled bathroom. Rate is for 4 people. 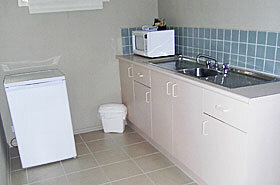 This is a 2 bedroom unit with a small kitchenette including a microwave, sink and cutlery\crockery and it has disable Facilities. 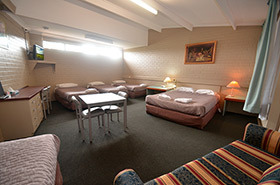 The room consists of 1 Queen and 2 Singles Beds and a double sofa can be used. 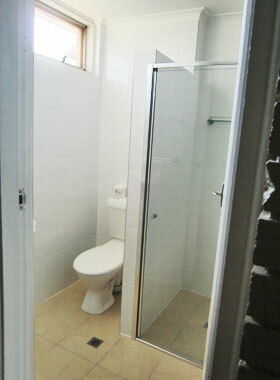 The unit can sleep 4 nicely but up to 6 people may rent this. 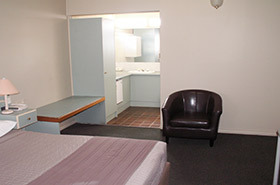 The Unit has free WiFi, tea and coffee making facilities, fridge, toaster, iron, ironing board, electric blankets, TV with foxtel and a hairdryer. 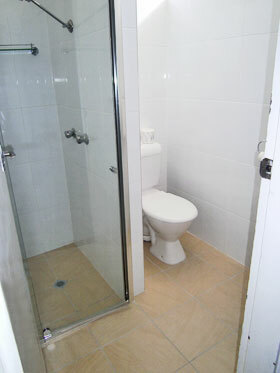 This unit is has disabled access for wheel chairs. Rate is for 4 people. Each additional persons $10 each. 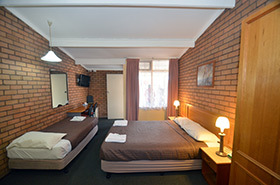 Standard Queen Twin Room has 1 Queen Bed and 1 Single bed or 2 Queen beds and can accommodate 3 people. 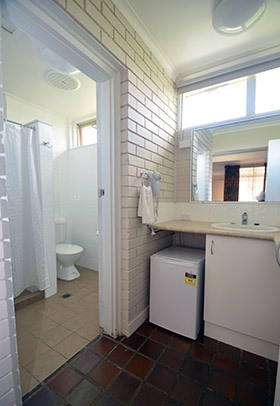 The Unit has free WiFi, tea and coffee making facilities, fridge, toaster, iron, ironing board, electric blankets, TV with foxtel, hairdryer and new tiled bathroom. Rate is for 3 people. Managers Special Rate can apply to these for long term customers. 1 Queen bed. 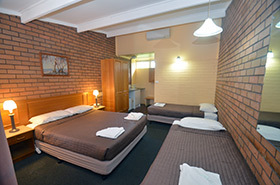 The Unit has free WiFi, tea and coffee making facilities, fridge, toaster, iron, ironing board, reverse cycle air-conditioning, electric blankets, TV with foxtel and a hairdryer. 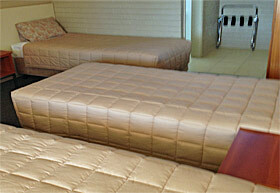 A rollaway bed can be added. Rate is for 2 people. 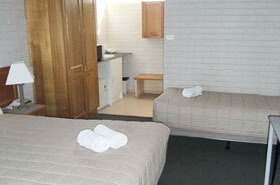 We specialise in large groups and can cater for accommodation and meal packages for your work collegues. 3 Single beds. 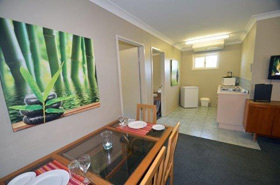 The Unit has a microwave, free WiFi, tea and coffee making facilities, fridge, toaster, iron, ironing board, reverse cycle air-conditioning, electric blankets, TV with foxtel and a hairdryer. Rate is for 3 people.